Natural Foods – It’s amazing how many things are edible if you know what to look for. Many natural foods require an acquired taste, so that’s why you don’t see them at the local market. However, when it means abating hunger, it’s worth embracing. I try to sample edible foods as I run across them so that I know what to expect, and start acquiring the taste for the times I’ll need to eat them. You will find these in the tropical regions. By placing a sharpened stick “point up” in the ground, you can slam the coconut onto it and rip the outer husk off. 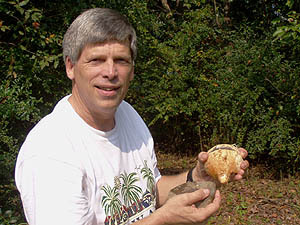 Then, by taking a stone in hand, you can strike the coconut on it’s equatorial line and it will break open. You can drink the fluid (or coconut milk), eat the white “meat” and use the shell for a bowl. The dried outer husk makes good tinder. Chickweed can best be described as a ground cover that grows in a thick clump or mat consisting of leaves, stems, tiny buds, and flowers, all of which can be eaten. 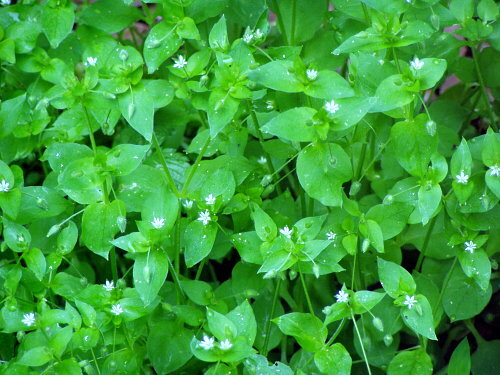 Chickweed is an annual that thrives in the cool, wet months, and can germinate throughout the year. 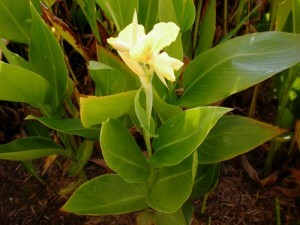 It will generally appear in sunny areas of bare, moist, rich, soil. 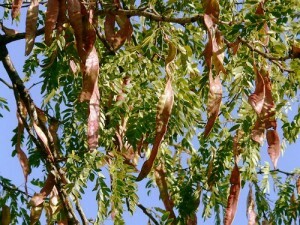 In summer, it’s mostly found in partly shaded places. Chickweed is simple to identify with opposite pairs of small, teardrop shaped leaves with tiny white star-shaped flowers. The stem has a delicate almost hollow-like structure with a single line of hairs that run up one side. For more information including medicinal uses read my blog on Chickweed – An Edible Yard Plant for more detail. 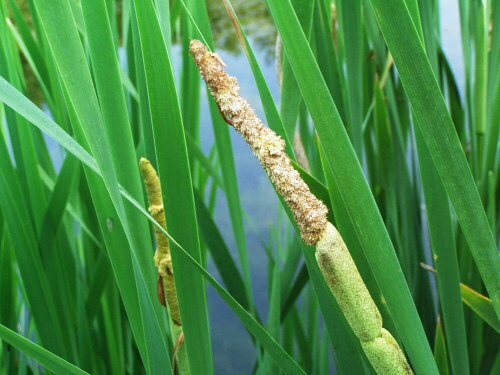 The cattail provides several edible parts. New blossoms can be sliced and fried and you can collect pollen from the upper portion between May and June that can be used as a supplement to flour to make pancakes and biscuits. New shoots can be pulled up to reveal a tender stalk similar to celery in taste. The roots are quite starchy and can be boiled or roasted. They are quite fibrous so some folks pound out the starch first before preparing. For more detail read my blog on Bloomin’ Cattails for more detail. The Dandelion is generally revered in the U.S. as a weed, however, it is both nutritionally and medicinally rich. Nutritionally it provides carbohydrates and vitamins. The leaves can be eaten raw like a salad or boiled like mustard greens. 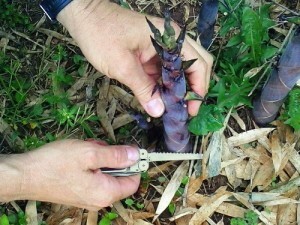 The root can be boiled like carrots, and the blossom can be batter-fried. Medicinally, it is a diuretic, so you may not want to eat in abundance for long periods. Garlic Mustard is a plant belonging to the mustard family. 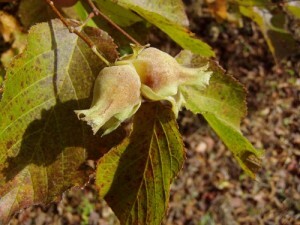 It is found in dry or wet open land or along trailsides. 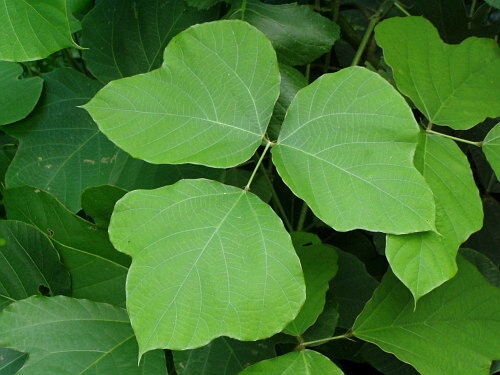 It is easily identified by the slight triangular or heart shaped scalloped leaves that are heavily textured by veins. The mustard family of plants are basically all edible and have a square or ridged stalk in common. For more information including medicinal uses Read my blog on Garlick Mustard – Not Just Italian for more detail. Kudzu is a runaway vine that grows throughout the South. It is incredibly prolific, grows like crazy, and can over run indigenous foliage and trees. I spoke with one of the senior locals in my area who said that she had cooked kudzu by breading it and frying it… similar to those who eat squash blossoms. I’ve discovered that the lighter green leaves at the ends of the vine are less robust. When boiled, you can reduce any bitterness by pouring out the first round of water and boil it a second time. However, I’ve tried sauteing the leaves in olive oil with some salt and pepper and was delighted with the results… a civil taste. Read my blog on Cooking Kudzu for more detail. Lamb’s quarters has a few different nicknames like pigweed, goosefoot, white goosefoot, wild spinach, and lamb’s quarter (singular), depending on where you live. It is not related to “lamb’s lettuce” or “lamb’s ear”. 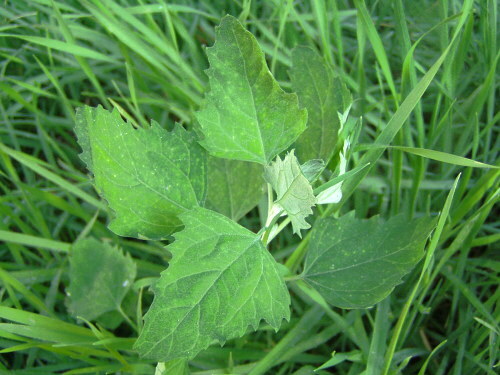 Lamb’s quarters produce triangular velvety-textured leaves and the entire plant, including the stems, is edible. You may notice small black seeds still encased in tiny green pollen-like balls, which are also edible. Young leaves and shoots are preferred and can be eaten raw or cooked. In a domestic situation (like in your kitchen) lamb’s quarters can be used in any recipe that calls for spinach and can be included in all kinds of dips, dressings, salads, sauces, soups, and main dishes. 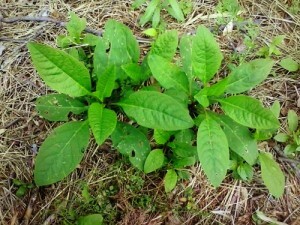 Plantain is edible and medicinal. 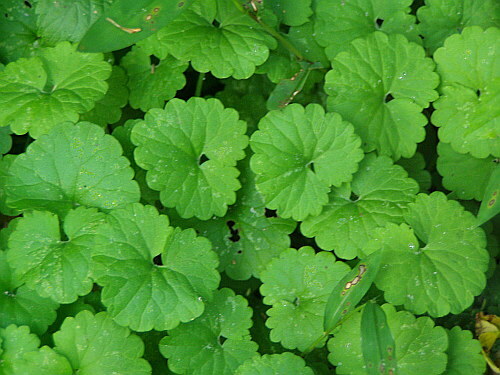 The young leaves are edible raw in salad or cooked as a pot herb and are very rich in vitamin B1 and riboflavin. A poultice of hot leaves can be bound onto cuts and wounds to draw out thorns, splinters and inflammation. The root is said to have been used as an anti-venom for rattlesnakes bites. Prickly Pear (also known as nopales) is a cactus which has multiple parts that are edible. The stalk, also known as a paddle, is pear shaped and flat. You shave off the spikes and eat either raw, or cook by frying or boiling. It has a consistancy similar to okra, so it’s kind of slimy. Many folk cut it up into 1/4″ pieces and fry with eggs. The fruit, known as fingers or tuna, is often sweet and full of seeds, but very tasty. It can be eaten like fruit. Purslane (also known as pigweed) was originally introduced from Europe and is found throughout North America in waste places and fields. As shown in the photo, the plant appears prostrate with shiny paddle-shaped succulent leaves. When picking it, break it’s stem to confirm it has clear juice. It’s evil poisonous twin is known as spurge, and when the stem is broken oozes a milky sap. 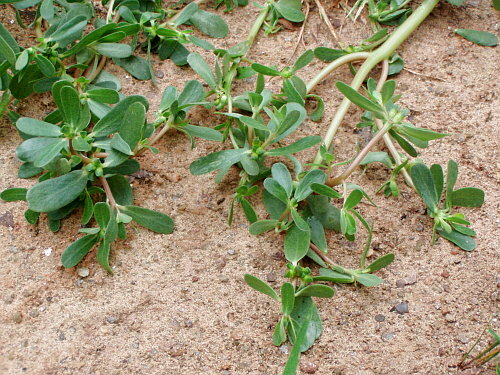 Purslane is a healthy food, but spurge will make you sick. It is rich in vitamin E, vitamin C, beta carotene, calcium, iron and quite high in protein, and is considered a better source of essential omega-3 fatty acids than any other leafy plant. It can be eaten raw like salad or boiled as a vegetable dish. Rock Tripe, part of the lichen family, grows on boulders and rock walls. It is a wavy but tough leaf just a few inches in diameter. Like other lichens, it should be soaked in water to remove the purgatives (strong laxative) that they contain. Then they can be eaten raw, or, dried to be boiled at a later time. 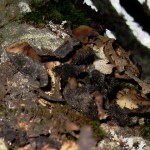 There is a bracket fungus known in the U.S. as “Turkey Tail”. In Japan it called “Riverbank Mushroom”. 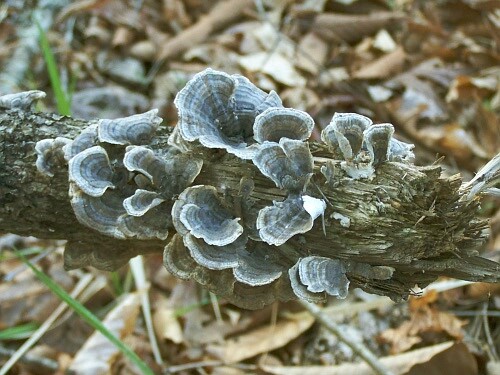 It’s technical name is Trametes Versicolor. Some folks consider it non edible because it can be too corky & tough, but they are not toxic. They generally attach to decaying logs along the back edge of the fan and have no discernible stem. It is an annual rather than perennial and can been seen throughout the year but are most fresh in the Spring. Like many other fungi, they are also said to have a medicinal benefit in reducing tumors For more detail read my blog on Edible Fungus for more detail. Yucca is a multi-resource plant. The white blossom is edible and can be eaten right off the stalk. The roots are harvested and prepared like potatoes which can be boiled or roasted. The post season stalk is used for firecraft – both as hearth board and spindle. Published On Saturday, June 01, 2013. 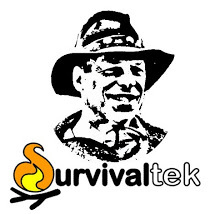 Under: Bushcraft. Published On Saturday, May 18, 2013. Under: Bushcraft. Published On Saturday, November 24, 2012. Under: Bushcraft. Published On Saturday, October 27, 2012. Under: Bushcraft. Published On Friday, September 21, 2012. Under: Bushcraft. Published On Friday, August 24, 2012. Under: Bushcraft. Found your site via “Primitive Ways”. You maintain a very interesting and informative site. absolutlely loved the figure 4 deadfall with dinner ware. 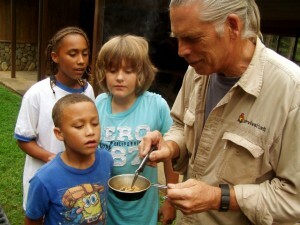 As an herbalist, my interest is in wild edibles and herbals. You have some easy to recognise herbals and very informative regarding their uses. I’ll be back here often. Nice website! Thanks for coming to [my] class… I’m interested to learn from you that purslane has an evil twin called Spurge. Have you seen it here in NC? Also, when you asked me about kudzu, I forgot to tell you I know a woman who has a kudzu farm and they make kudzu jelly! Great job on this site! Keep up the good work! Huh. I wouldn’t have thought you could drink that stuff. But then maybe we’re thinking of different species of yucca. Also, yucca leaves make some nice cordage if you prepare them right. The internal clear fluid of a coconut is NOT coconut milk. Coconut milk is made from an extract of the white meat of the coconut. Don’t forget the common stinging nettle that can be cooked and is similar in taste to spinach but has more vitamins, minerals and nutrition than spinach.